The Solemnity of the Annunciation usually falls on March 25, nine months before Christmas. It celebrates Mary’s acceptance of the message of Gabriel. 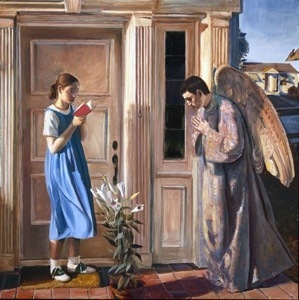 This Annunciation is set in suburbia, but the symbolism is quite traditional. Mary is reading from Isaiah about the Virgin who conceives and bears a son. The lily represents her purity, and she is welcoming St. Gabriel. There is a copy of the Angelus Prayer for Children for children at the Religion Teacher website. The Annunciation…and Us by Fr. James Martin in America magazine.